Q. Can you tell us how you became a writer? A. It started with a “Thank-You” note. All through high school, university, and grad school I wrote in secret, keeping thoughts, ideas, short stories and dreadful poetry in notebooks under by bed. My New Year’s resolution for the year 2000 (after much prodding from my husband) was to start putting my writing out into the world. So, I declared 2000 to be “the year of sending thank-you notes to people I didn’t know.” My first letter led to a guest appearance on the Oprah Winfrey Show (and that was just January!) After that whirlwind experience, I kept writing, freelance documentaries for CBC radio, a short story here and there, and eventually my first novel. I still commit random acts of writing thank-you notes from time to time… just to keep the karma flowing. Q. What inspired you to write this particular novel? Is there a story about the writing of this book that begs to be told? A. I’ve always loved digging into my family history to uncover stories from the past. While researching my mother’s side of the family tree, I discovered that my great-great grandmother had been a female physician in New York City during the 19th century. Her work as a doctor in the tenements and on the streets of the Lower East Side inspired me to write The Virgin Cure. Q. What is it that you’re exploring in The Virgin Cure? A. The title comes from a terrible myth that was prevalent in many places during the 19th century – the notion that a man could be cured of disease (syphilis was incurable at the time) by having sexual relations with a virgin. In researching the history of the myth, I found that it’s still alive today (surrounding AIDS rather than syphilis) and has led to devastating consequences in various parts of the world. In tracing the life of a young girl at risk in a historical setting I hoped to better understand how such a terrible thing could still be happening in the present. Why are young girls considered a commodity? What happens in a culture to allow this? Q. Who is your favourite character in the novel, and why? A. I adore Moth. My first draft of the novel was in third person, but the more I wrote about Moth, the more she pushed her way to the front of my writing, her voice nagging in my head saying, “get out of the way and let me tell the tale.” Once I started writing from her point of view, everything made sense. I couldn’t wait to get back to my desk each day to see where she would take me. Q. 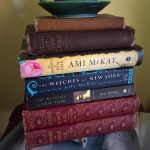 Are there any tips you would give a book club to better navigate their discussion of The Virgin Cure? Q. Do you have a favourite story to tell about being interviewed about your work? Q. Has a review or profile ever changed your perspective on your work? A. Sarah Weinman maintained a wonderful blog called Confessions of an Idiosyncratic Mind. 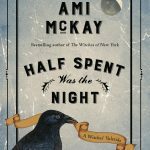 In a review of The Birth House she wrote, “Can we call Ami McKay the current-day heir to Lucy Maud Montgomery? The issues McKay tackles are far darker and more sinister than Montgomery ever allowed herself to explore in plain terms.” I was incredibly flattered to have been compared to LMM, of course, but more importantly Sarah’s words led me to consider the question, “what don’t I allow myself to explore in my writing?” I keep that question on a card above my desk knowing that the answer to it is often where I need to go next in my work. Q. Which authors have been most influential to your own writing? A. While writing The Virgin Cure I re-read several Charles Dickens and Edith Wharton novels I’d read when I was in my early teens. It was amazing to see how much of their work had stayed with me over the years and how their words had influenced the story I wanted to tell. Q. If you weren’t writing, what would you want to be doing for a living? What are some of your other passions in life? A. I think I’d enjoy being a vocal coach. Before I moved to Nova Scotia, I taught music at a high school in Chicago. The part of the job I loved best was working one on one with students in the voice studio. “Finding voice” has been essential part of my life both as a musician and as a writer. There’s something quite magical in helping someone else find theirs. Q. If you could have written one book in history, what book would that be? A. I can’t think of a book I’d like to have written word for word, but the premise of Nabokov’s The Real Life of Sebastian Knight is absolutely brilliant and I wish I’d thought of it first.